Present Moment Retreat is an exclusive oceanfront boutique hotel and yoga retreat in the quiet beach town of Troncones, Mexico. Situated a short drive up the Pacific coast from Ixtapa and Zihuatanejo, the laid-back yoga resort features quaint terraced bungalows with private bathrooms and rainfall showers, meditation gardens, and breathtaking views. Deluxe amenities at the resort include an exclusive spa and wellness center, an outdoor swimming pool, beautifully manicured gardens, and a casual restaurant. 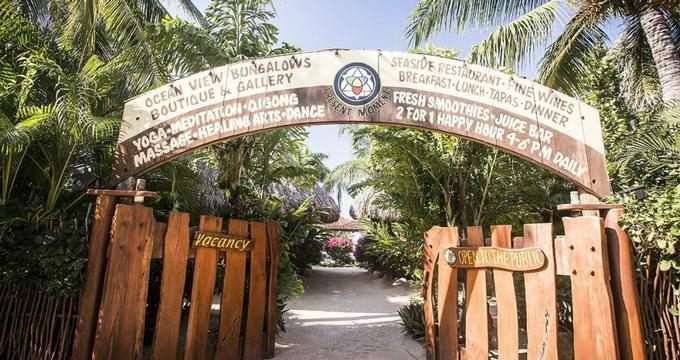 Guests can enjoy healthy gourmet cuisine, a variety of yoga-by-the-sea, meditation, wellness, qigong, and dance classes, along with other activities such as eco and culture tours, sunset horseback riding, kayaking, waterfall hiking, surfing and surf lessons, and special surf-yoga excursions. Present Moment Retreat features 11 unique palapa-style bungalows, designed and hand built using local and traditional materials and surrounded by lush tropical gardens and courtyards. Cottages are stylishly arranged with easy access to the beach, the swimming pool, and the restaurant, and have private terraces or balconies with stunning ocean views. Charming, Crusoe-esque bungalows are decorated with traditional Mexican and Southern Californian décor, antiques and fine art, pillow-top queen-sized beds with luxurious 400 count cotton bedding and canopies of sheer white linen, en-suite bathrooms with ocean stone walk-in showers with rain showers, soaking tubs, plush towels and bathrobes and designer toiletries. Bungalows have spacious and airy living areas that flow out onto full decks and terraces that breathtaking 360-degree ocean views. Present Moment Retreat serves delicious Intercontinental fusion-style cuisine, including regional Latin American dishes, freshly caught seafood, Asian delicacies, local Latin American dishes, vegetarian specialties, and decadent desserts. The two-level restaurant allows guests to dine on the white sands of the beach or the wooden cantilevers overlooking the ocean and also serves an array of handcrafted cocktails, signature spirits, fine wines from around the world, and a Tequila menu with more than 50 of the top distillery labels in Mexico. A complimentary homemade breakfast is served every morning and includes freshly brewed coffee, tea and other hot beverages, fruit juices, fresh fruit platters, yogurt, cereals, hot entrées and signature dishes, eggs, and freshly baked bread, muffins, scones and more. Present Moment Retreat offers an array of amenities and facilities for guests to enjoy during their stay, including an exclusive spa and wellness center, an outdoor swimming pool, beautifully manicured gardens, and a casual seaside restaurant and bar. Activities range from waterfall hiking, horseback riding, eco and culture tours, and kayaking to surfing and surfing lessons, surf-yoga excursions, yoga and meditation classes, qigong, and dance classes. The resort also offers an exclusive Turtle Release Program, snorkeling and scuba diving, and exploring the quaint seaside village. Nestled between the Sierra Madre mountains and the Mexican Riviera, Troncones is a quaint, uncrowded beach village located about 20 miles north-west of Zihuatanejo on the coast of the state of Guerrero. The intimately populated town boasts a pleasant sense of isolation with an unspoiled and barefoot beach vibe that has been lost in many of the other seaside towns along Mexico's coastline. The three-mile-long shoreline offers excellent surfing, beautiful white sandy beaches for beach-combing and horseback riding, and crystal clear waters for snorkeling and scuba diving. Other activities in the area include eco-tours and adventures, hiking in the Sierra Madre mountains, kayaking trips through Caprie's Estuary and turtle-watching programs. Present Moment Retreat offers an idyllic place for exotic destination weddings with dramatic and photogenic settings for photographs, exclusive weddings services and award-winning catering and cuisine. The Retreat offers a variety of packages for different occasions, ranging from Cleansing and Surfing Packages to Restore and Refresh and Group Packages, which include deluxe overnight accommodations, gourmet cuisine, and a range of classes, lessons, and activities.